Do all your deep pondering with the protective, yet preposterous pixEOS Headgear. Deliver yourself from boredom by wearing this happy head garment. It is certified by a team of decentralized semi-fungible and semi-anonymous crypto art technicians. Patterned after the most stylish wrestling headgear, this item is sure to turn heads throughout the entire art market. 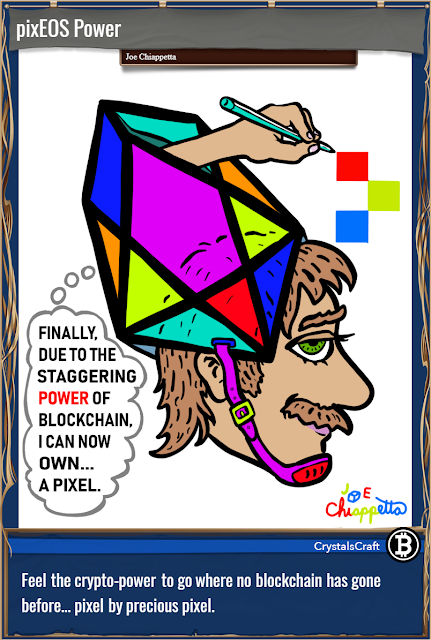 Once fitted with this fashionable helmet, bright and artsy ideas will effortlessly pop out from your blockchain brain with no end in sight! This animation will soon be available only on the Grand pixEOS Art Gallery. As limited-edition art, this whimsical piece will be among the first rare digital art items to be released on the EOS blockchain. If the above animated image looks somewhat familiar, you have a good memory. This new version with the green background is a revised variation of a comic that I issued previously in the Book of Orbs marketplace... however that original comic (with a white background) is not animated. While the comic version with the thought balloon brings the humor, the new animated version has its own set of fun surprises too. Compare all the differences for yourself, let me know which version you like best, and even consider collecting them both. This rare digital art, which can be purchased on MakersPlace, is titled "Big Appetite for Nuts." Perhaps you can guess why this crypto art has such a title? As a long time cartoonist, it is hard to resist making lighthearted jokes about the art experience. Such things can be seen in this satirical comic about the art market. 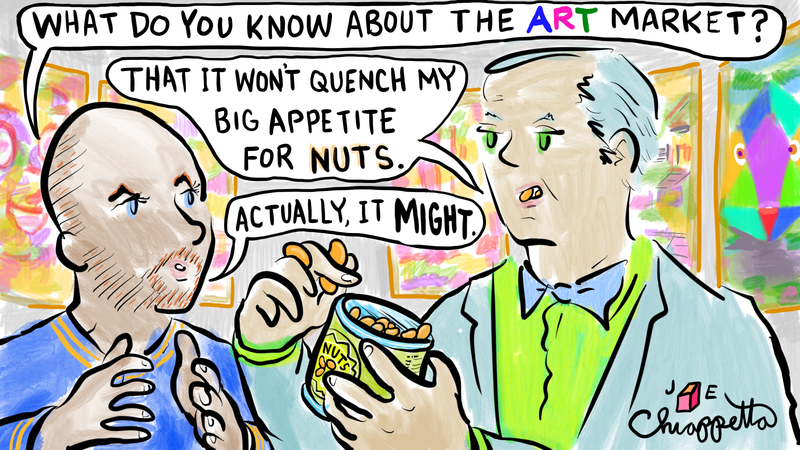 It is a cartoon also influenced by my real life appreciation for nuts. I eat them every day. While poking fun at the art market is pretty easy, this sector is actually no laughing matter; it's big business. Gratefully, data about art appears to be becoming more and more user-friendly. Artist industry professionals should take note of this, as relevant data can help guide business plans toward the appropriate opportunities. One fine example comes from a recent 408 page survey using data and research from Dr. Clare McAndrew of Arts Economics along with an international art fair producer as well as an investment banking company. Here is what I got out of their collaborative efforts, known as the Art Basel and UBS Global Art Market Report, released in 2019 but covering data from 2018. Art market had just over $67 billion in annual sales. Just under 40 million different art transactions occurred. More millennials are buying art, especially those of high net worth. Countries where the largest total art sales happen are USA, UK, and China, in that order. Online art market made up 9% of all art sales. This level of digital disruption is considered low. The number 1 challenge in the art industry is finding new clients. The number 1 challenge for online art companies is increased competition from other online companies. On the auction side, Christie's hosted 88 online-only sales generating $86.4 million. An impressive 41% of new buyers to Christie's came from online. Male artists continue to dominate top sales and representation by major galleries and exhibitions. The report has a 3-page section on blockchain technology and cryptocurrency in the art market, plus it is covered briefly in a summary section. While not mentioned specifically by name, the article takes an unenthusiastic view of rare digital art on page 295: "A key issue in the tokenization of art, on- or offline, remains the lack of demand for the concept, which alongside management and other fees, will likely stall any mainstream interest for the time being." The mainstream art industry is cautiously warming up (somewhat) to using blockchain to possibly track the provenance of artwork. However there are many barriers that still need to be worked out, and blockchain providence providers appear to be competing with each other, creating unclear standard practices while not completely solving core issues (such as how to deal with errors on an unchangeable blockchain). The report gathered data from a variety of sources through many partners. It is unclear whether rare digital art market data was included in the research. There are countless other observations that can be captured from this report. Yet the above is what stood out to me. Since much of my professional arts work today involves activity in the rare digital art field, and since the specifics of rare digital art analysis is largely missing from this mainstream study, it is necessary to take this topic a little further. Currently I have issued rare digital art on 8 different marketplaces using 2 different blockchains (Bitcoin/Counterparty and Ethereum), with big plans to also issue new art on a 9th marketplace (pixEOS) through a 3rd blockchain (EOS) as soon as it opens later in Q2, 2019. There are many more rare digital art marketplaces than these nine. In fact, the number of additional rare digital art marketplaces keeps growing and it is difficult to keep track of them all. Moreover, there currently is no up-to-date comprehensive list of where all these active markets are located. Some launched and are doing great (like many that I am on). Some tried to launch but never did. Others launched yet became inactive. And more are on the way. There are even tools now available (Pixura) where anyone without coding knowledge can now make their own rare digital art marketplace on the Ethereum blockchain. Therefore, let's take the mainstream survey findings and combined them with my own experience to come up with the following additional conclusions. On the one hand, the rapidly increasing number of rare digital art markets means easier entry for artists wanting in on this unique market opportunity. On the other hand, just like in the physical art market, this increase in rare digital art markets means that the supply of rare digital art will grow faster than demand. With supply being greater than demand, the majority of sale prices must be set lower to remain competitive. This means that it is a buyer's market. Art buying collectors should take note, as many bargains for high quality rare digital art are readily available. The rare digital art marketplaces who innovate and are great at communicating that innovation to the world (as in marketing) will be better positioned to survive and thrive. The gamification of art collecting and creating will drive future growth. For an example of innovation and gamification, look at pixEOS' roadmap as well as what they have already delivered in the crypto art space. Research on rare digital art markets could be beneficial to this sector's maturity, and help paint a more accurate picture of the art market as a whole. Since the sales figures and unique collector wallet addresses are all on publicly accessible blockchains, this data should be somewhat easier to compile. Rare digital art markets should form some sort of professional association to leverage shared resources and collaborate when strategic. Barriers to entry for women in rare digital art are much less evident compared to traditional art markets. Happy making, marketing, and educating to you! I started drawing this art on the pixEOS Paint app, with a concept in mind to depict a respectful view of women in the blockchain space. 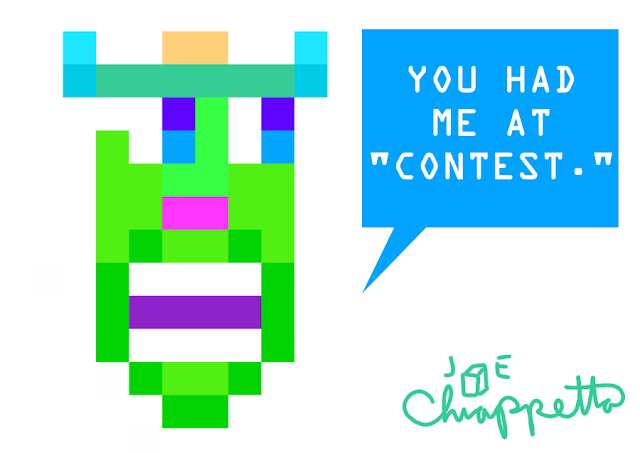 I continue to have a good deal of artistic gaming fun using pixEOS Paint. If a person took a community graffiti wall, MS Paint, digital real estate, gambling, cryptocurrency, and put them all in an online blender, the result would be pixEOS Paint--no joke. While I felt that the still image of these women was pretty cool, I chose to experiment further. After adding some very light animation to an already minimalist pixel drawing, I decided to give it an equally simple title. May all the women (and men) in blockchain enjoy this art of pixelated fun. This art is a limited edition piece of crypto art, and one of my most colorful creations. Only 10 editions exist as rare digital art. It can be purchased using Ethereum on the Portion marketplace. This piece has been issued as rare digital art on MakersPlace. There it can be purchased using Ethereum or a credit card. It is a crypto collectible item with only 50 limited editions available.